DESPITE the midday heat, it is serene and comfortable in Herbal Oasis’ open shed in Port Dickson. Birds, butterflies and stingless kelulut bees flit in and around the vegetation. It’s the sort of scene that makes people want to quit their air-conditioned office job. Located in the compound of PD Ostrich Show Farm, Herbal Oasis Farm is founded and run by Stella Kiang Ciu Leing, 34. She also runs Herbeco, which makes and sells herbal teas. Kiang is a third generation traditional Chinese herbalist, having learnt the craft from her mother and maternal grandfather. She also has a Science degree from Universiti Tun Abdul Rahman (UTAR) to complement the family knowledge. 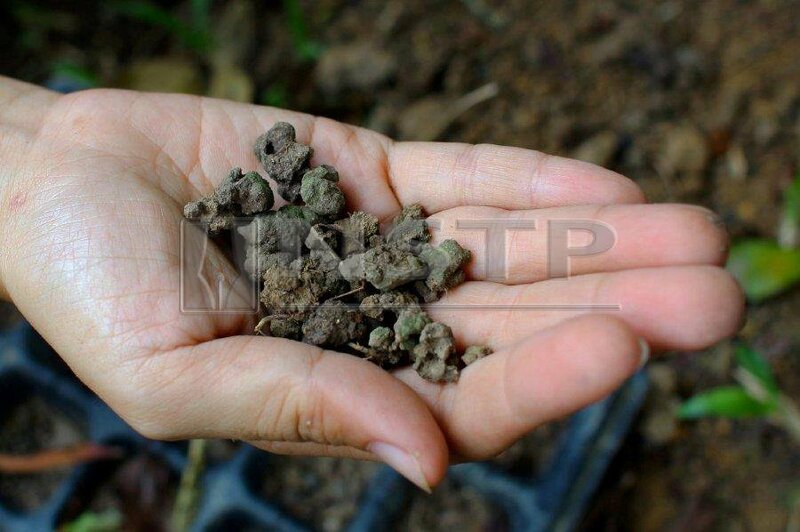 As a herbalist, Kiang recognises that tea from the leaves of Yellow Cow Wood tree (Cratoxylum cochinchinense) — also Geronggang Derum Seluncor in Malay — is good for the liver and to improve the health of those with a not-so-healthy lifestyle. It’s a native tree and her family used to forage for its roots in the jungle although it’s cultivated nowadays. “The Malay, Chinese and Indian communities in Malaysia have diverse local herbal knowledge but this often only exists within the particular community,” says Kiang. One of Kiang’s plan to do this is through a specially-designed herb garden at Kebun-kebun Bangsar (KKB), which is now in the funding stage. As the name implies, the Herb Bamboo Greenhouse will grow herbs and will be made of bamboo to explore its potential as a sustainable building material. In the meantime, Kiang volunteers at KKB. The community farm is located on TNB land in the Kuala Lumpur neighbourhood underneath the utility company’s electrical pylons. It’s where city folks relish in the joy of working with plants and soil. It has long been documented that gardening is good for the body. Being outside under the morning sun provides exposure to vitamin D. Digging, planting, pruning, carrying soil and garden wastes is a form of exercise. KKB volunteers get an extra dash of cardio because the site is on a slope. Then there’s the communal aspect of community gardening, as people from different backgrounds and neighbourhoods work together for a common cause. But it’s also calming to garden alone as the rhythm of repetitive tasks allow the mind to tune out. Puttering about in the garden is surely better for the body than sitting down on the sofa watching television. Working with plants gives the individual a sense of purpose while engaging the senses. Flowers have scents, leaves have different textures and (certain) fruits, leaves and flowers can be eaten and tasted. In the UK, doctors have been urged to prescribe the activity for patients with cancer, dementia and mental health problems. Meanwhile, Berita Harian reports that in-house patients at Hospital Bahagia Ulu Kinta in Perak can work on the kitchen garden under staff supervision. They also look after chickens, fish and fruit trees in the property. Gardening is a beneficial activity, a useful skill and a tool to cope with illness. In the soil is the bacteria called Mycobacterium vaccae (M. vaccae), which gets breathed or ingested in as people spend time outdoors. One London oncologists found the lab version of the bacteria improved her patients’ mood. Meanwhile, another study, also conducted in the UK and using mice, discovered that M. vaccaeworks the same way as antidepressants. But working with soil will inevitably put people in contact with earth worms, which may leave some people squeamish. However, Kiang explains that worms are good for the soil as they turn the dirt from within, keeping it soft and workable. Worm poo is especially fertile. Kiang lavish her land with special EM (effective microorganisms) liquid to attract worms. “If you find worms in your garden, don’t kill it. Add compost to your soil as it is highly fertile and has beneficial microorganisms, otherwise you can use EM liquid to raise the soil’s nutritional content. These are practices for organic farming or gardening, where you don’t use chemicals,” says Kiang. People who care about their health will care about what they eat, and in turn will pay attention to the source of their food and may even start growing their own vegetables. Leafy local veggies like kangkung and mustard greens are usually easy for people to start off with. Fruity ones like tomatoes are more difficult. Another reason to grow veggies is that picky eaters, especially children, may be more interested to eat greens after being involved in the process. But some plants require patience and perhaps a bit of fear struck into them. “I have this passionfruit vine for three years and it grew lots of leaves but never any fruit. So I told the plant that it’s been long enough and it needs to start producing fruit or I will chop it down, and finally I have some passionfruit!” says Kiang with a laugh. Over on the property, hugging and encasing a tall tree is a plant that looks similar to popular house plant Monstera. But Epipremnum pinnatum has spots along the spine of the leaf, and the many gaps on each leaf are open. Kiang explains that its tea is good for digestion, although she’s fine if people want to use it as decoration. Another aspect of gardening that Kiang wants to impart is seeing the different stages of growth and how factors like sun, water, pests, pollinators and pollution affect plants. This gives a person a more holistic understanding of nature, and perhaps inspire them to be more responsible in their consumption of earth’s resources. * To help fund the Herb Bamboo Greenhouse, visit Kebun-Kebun Bangsar’s Facebook page. GOING by the moniker Yunika_Edibles on Instagram, Masrina Mohd Nadzir is an academic and researcher based in Kedah. The account is dedicated to her gardening activities. The things she grows include kale, beans, glass gem corn, mulberry and flowers such as zinnia and rose. On the two-year anniversary of her Instagram account, she writes; “My house has a small yard which I try to utilise fully for gardening. I started to garden as a means of adding more physical activities to my life because my job requires me to sit a lot in front of the computer. “Gardening is also a great stress reliever and a way for me to connect with nature. I always get great joy from gardening, when tasting vegetables or fruits not available at the local market and when seeing my garden become a playground for birds, butterflies, dragonflies and even my cats. “I usually garden during the weekends while working days are used to water the plants prior going to work. “Last year, I experimented with growing a lot of non-native plants while simultaneously filtering plants not suitable for my taste-buds/digestion (bye-bye, Malabar spinach and stevia) and do not grow well where I live (that’s you, edamame, zucchini and various heirloom cucumbers).